This function supports the legacy workflow. Using the [p,e,t] representation of FEMesh data is not recommended. Use interpolateSolution and evaluateGradient to interpolate a PDE solution and its gradient to arbitrary points without switching to a [p,e,t] representation. uOut = evaluate(F,pOut) returns the interpolated values from the interpolant F at the points pOut. If a query point is outside the mesh, evaluate returns NaN for that point. uOut = evaluate(F,x,y) returns the interpolated values from the interpolant F at the points [x(k),y(k)], for k from 1 through numel(x). This syntax applies to 2-D geometry. uOut = evaluate(F,x,y,z) returns the interpolated values from the interpolant F at the points [x(k),y(k),z(k)], for k from 1 through numel(x). This syntax applies to 3-D geometry. This example shows how to interpolate a solution to a scalar problem using a pOut matrix of values. Construct an interpolator for the solution. Generate a random set of coordinates in the unit square. Evaluate the interpolated solution at the random points. uOut contains some NaN entries because some points in pOut are outside of the unit disk. This example shows how to interpolate a solution to a scalar problem using x, y values. Evaluate the interpolated solution at grid points in the unit square with spacing 0.2.
uOut contains some NaN entries because some points in the unit square are outside of the unit disk. This example shows how to interpolate the solution to a system of N = 3 equations. Interpolate the solution at a circle. Plot the three solution components. This example shows how to interpolate a solution that depends on time. on the unit disk with zero Dirichlet conditions and zero initial conditions. Solve at five times from 0 to 1. Interpolate the solution at x = 0.1, y = -0.1, and all available times. The solution starts at 0 at time 0, as it should. It grows to about 1/4 at time 1. This example shows how to interpolate an elliptic solution to a grid. Use the built-in geometry functions to create an L-shaped region with zero Dirichlet boundary conditions. 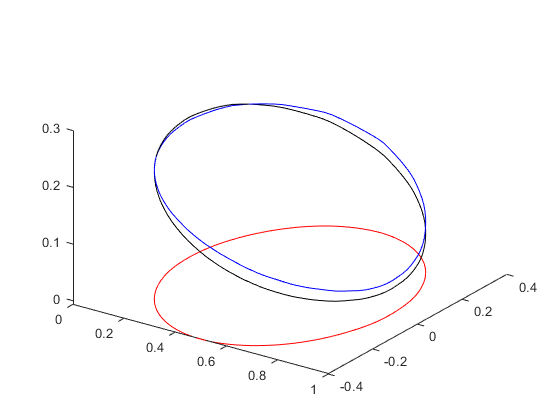 Solve an elliptic PDE with coefficients c=1, a=0, f=1, with zero Dirichlet boundary conditions. Create an interpolant for the solution. The resulting grid has some points that are outside the L-shaped region. The interpolated solution uout is a column vector. You can reshape it to match the size of X or Y. This gives a matrix, like the output of the tri2grid function. Interpolant, specified as the output of pdeInterpolant. Query points, specified as a matrix with two or three rows. The first row represents the x component of the query points, the second row represents the y component, and, for 3-D geometry, the third row represents the z component. evaluate computes the interpolant at each column of pOut. In other words, evaluate interpolates at the points pOut(:,k). Query point component, specified as a vector or array. evaluate interpolates at either 2-D points [x(k),y(k)] or at 3-D points [x(k),y(k),z(k)]. The x and y, and z arrays must contain the same number of entries. evaluate transforms query point components to the linear index representation, such as x(:). evaluate transforms query point components to the linear index representation, such as y(:). evaluate transforms query point components to the linear index representation, such as z(:). Interpolated values, returned as an array. uOut has the same number of columns as the data u used in creating F. If u depends on time, uOut contains a column for each time step. For time-independent u, uOut has one column. The number of rows in uOut is the number of equations in the PDE system, N, times the number of query points, pOut. The first pOut rows correspond to equation 1, the next pOut rows correspond to equation 2, and so on. An element is a basic unit in the finite-element method. For 2-D problems, an element is a triangle in the model.Mesh.Element property. If the triangle represents a linear element, it has nodes only at the triangle corners. If the triangle represents a quadratic element, then it has nodes at the triangle corners and edge centers. For 3-D problems, an element is a tetrahedron with either four or ten points. A four-point (linear) tetrahedron has nodes only at its corners. A ten-point (quadratic) tetrahedron has nodes at its corners and at the center point of each edge. For details, see Mesh Data. For each point where a solution is requested (pOut), there are two steps in the interpolation process. First, the element containing the point must be located and second, interpolation within that element must be performed using the element shape functions and the values of the solution at the element’s node points.